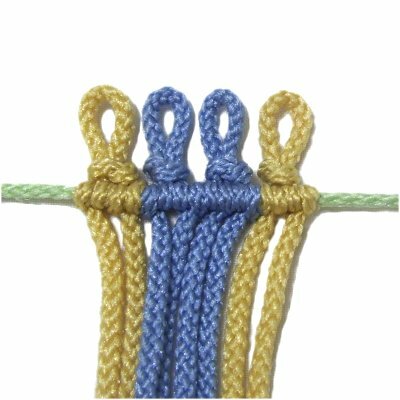 Description: These Unique Mounting Designs can be used during the mounting process, at the beginning of a Macrame project. They are created by making the primary knot at the center of a working cord. 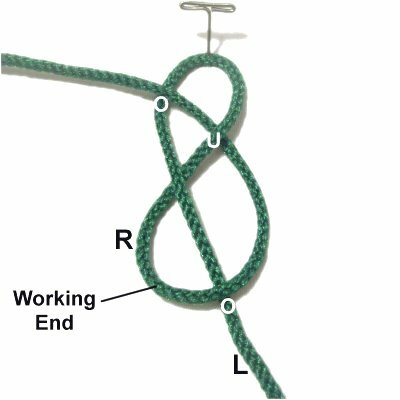 The knot is then attached to a holding cord, ring, or dowel. The three designs listed below show what you can do with the Slipknot, the Figure Eight knot, and Celtic Square Knot. 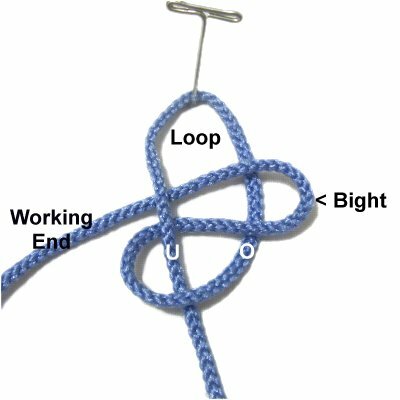 Other types of knots can be used in this manner, so try experimenting after you have practiced these designs. 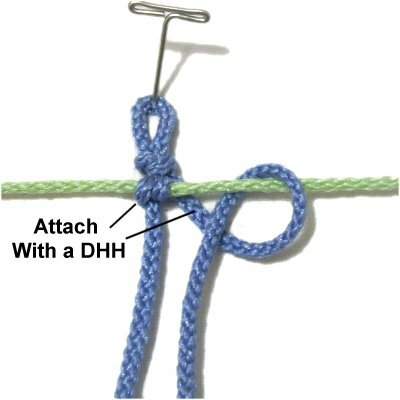 Be sure to practice the Double Half Hitch before you get started. Only the mounts that feature KNOTS are on this page. 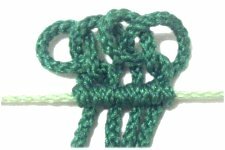 Designs featuring simple loops can be found on the page called Picot Mounts. Unique mounting designs are often selected because they have loops. In this design, the Slipknot is attached to a holding cord. You will need one working cord for each Slipknot you plan to make. You also need one holding cord. When practicing, you only need 12 - 15 inches of material. Step 1: Fold the working cord in half. Make a loop, crossing right over left. The working end is the segment on the left. 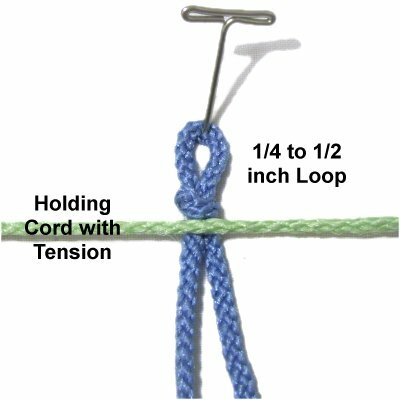 Step 2: Fold the working end to form a bight, then push it through the loop from below (under - over). 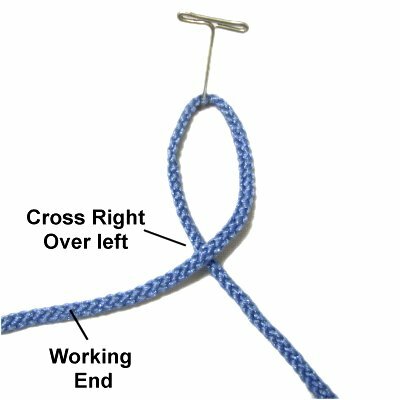 Tighten the loop by pulling on the ends and the bight. Step 3: Arrange the holding cord horizontally. Make sure it is stretched so it has tension. Place the Slipknot next to it, and adjust the size of the loop. It should be 1/4 to 1/2-inch tall, depending on the size material you are working with. Secure the loop. 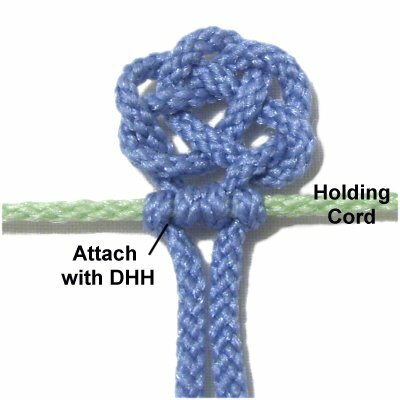 Step 4: Attach both halves of the working cord to the holding cord with a Double Half Hitch (DHH). Tighten the knots firmly, so there are no gaps between the Slipknot and the holding cord. Step 5: Repeat steps 1 - 4 with additional cords. 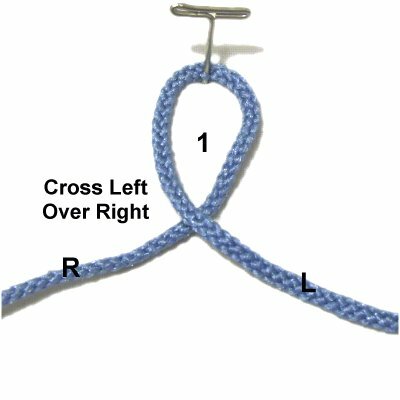 When using any of these unique Mounting Designs in a Macrame project, you will probably be mounting more than one cord. When you are just practicing, this step is optional. 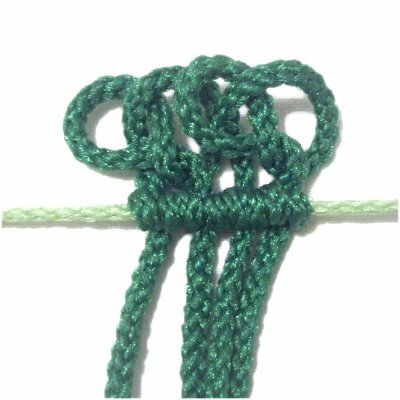 This design is based on the Figure 8 knot. Because it's wide rather than tall, the knots will overlap slightly if you mount more than one cord. You need one holding cord and one or more working cords. They should be at least 15 - 18 inches long if you are practicing. 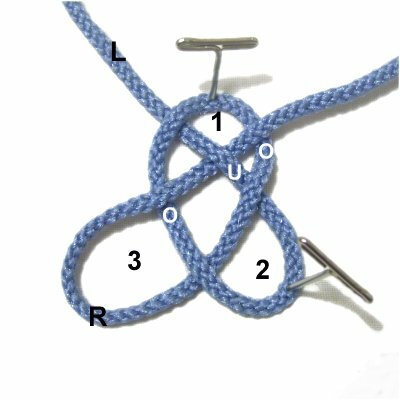 Step 1: Make a loop in the center of the working cord, crossing left over right. The right half is the working end for the next step. Step 2: Move the working end (right half) to the right, passing over the left half of the cord. Bring it to the first loop, and pass it through from below (under - over). Tighten the knot until it's the size you want. Step 3: Arrange a holding cord on your work surface horizontally. Make sure it has tension. 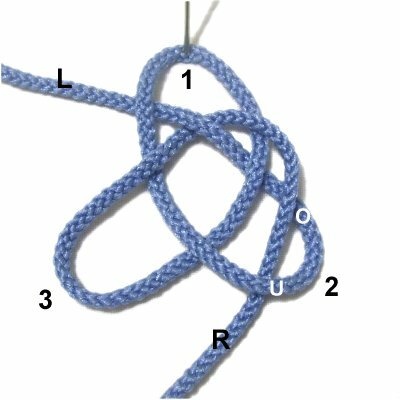 Place the Figure Eight knot close to it, arranged sideways. 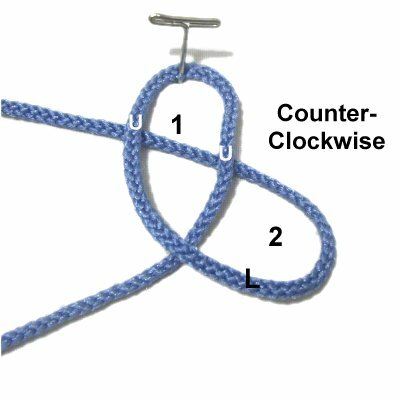 Balance and adjust the two loops of the Figure 8 knot, leaving a little space between it and the holding cord. Repeat steps 1 - 3 if you wish to mount more cords. 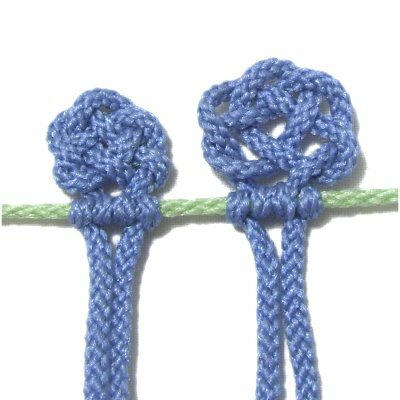 They will partially overlap each other due to the width of the knot. Description: Unique mounting designs can be made with Celtic or Chinese knots. This one features the Celtic Square knot, which can be made small, or larger with more open spaces (shown above). You will need one working cord, at least 18 inches long, and one holding cord. Step 2: Move the left half of the cord around in a counter-clockwise direction, making loop 2. Pass it under both sides of loop 1 as you bring it to the left. Step 3: Move the right half of the cord around in a clockwise direction, making loop 3. Pass it over - under - over loop 1 as you bring it to the right diagonally. 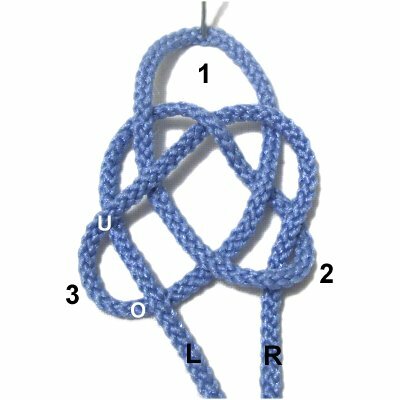 Step 4: Make sure you can clearly identify the two lower loops (2 and 3). 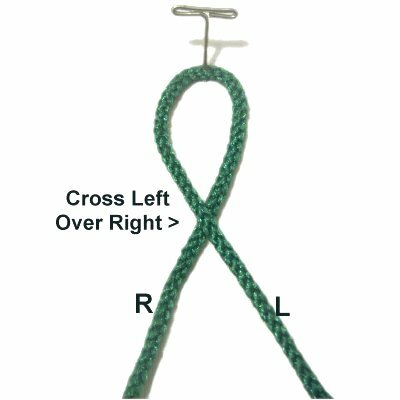 Bring the right half of the cord down to loop 2, and pass it through from the top (over - under). Step 5: Bring the left half of the cord down to loop 3, and pass it through from below (under - over). Tighten and balance the knot until it's the size most appropriate for what you are making. When practicing, it can be any size. 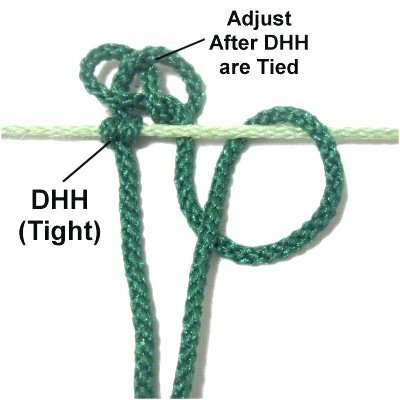 Step 6: Attach the Celtic Square Knot to the holding cord with DHH. Step 7: Repeat steps 1 - 6 with additional cords (optional). These are different sizes so you can see a loose knot versus a tight one. Have any comments about Unique Mounting Designs? Contact Me.